We’d love your help. 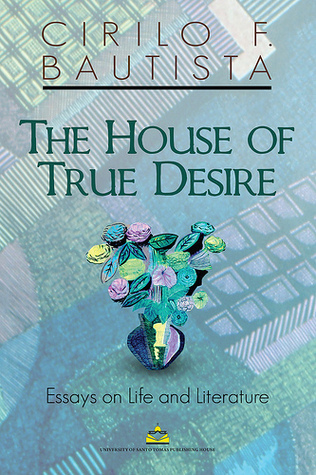 Let us know what’s wrong with this preview of The House of True Desire by Cirilo F. Bautista. This book brings together some 115 essays from Bautista's weekly column, "Breaking Signs," which has been appearing in the Philippine Panorama, Sunday magazine of Manila Bulletin, for 17 years now. The subject is the interlink between life and literature, how one provokes the other for an interesting and fruitful dialogue. How far is life reflected in literature, and liter This book brings together some 115 essays from Bautista's weekly column, "Breaking Signs," which has been appearing in the Philippine Panorama, Sunday magazine of Manila Bulletin, for 17 years now. The subject is the interlink between life and literature, how one provokes the other for an interesting and fruitful dialogue. How far is life reflected in literature, and literature in life? Bautista speculates on books, people, events, and institutions, looking even for the most tenuous of answers, to bring us little reports with enjoyable freshness and insight. He studies human action with the view of explaining their irony or peculiarity, as in Mike Tyson biting off Evander Holyfield's ears in their boxing match in 1997; the grandeur of Kublai Khan; the commercialization of Christmas; the kindness of strangers; and the art of piano repair. He shows us how life refracts poetry and fiction and makes them significant concerns even in a society not known for literary patronage. To ask other readers questions about The House of True Desire, please sign up. How to view this story?